Are You Raising Fit or Fat Kids? There is an epidemic of overweight kids - and you don't have to read the newspaper or watch the news to find that out. Just take a look at kids at the mall or in the schoolyard. You can also see a shortage of kids outside playing, biking or running. What can parents do to make sure their kids are not part of the statistics? Here are some answers from Bridget Swinney, author of "Healthy Food for Healthy Kids" (Meadowbrook Press). Exercise together as a family. This shows your kids that you think exercise is important enough to make it a family activity. That doesn't mean you should necessarily head to the gym together! Fun family activities that you can also work up a sweat with include biking, hiking, skiing, kayaking, tennis, basketball, and skating. If your family hasn't done a lot of physical activity before, take it on as a family adventure. Research easy hiking trails, or simply take a half-hour walk in the neighborhood. Avoid buying soft drinks, juice drinks and flavored teas. It's often what we drink, not eat, that pack on the calories extra pounds. Encourage your family to drink water, tomato juice, milk or fresh tea (with a teaspoon of sugar if necessary) instead. Even 100% fruit juice should be limited since it has roughly the same number of calories as a soda. Keep a lot of fresh fruit in the house at all times - and keep it on the counter where it will be seen and hopefully eaten. Ditto for raw baby carrots and celery. If a parent is home when kids come home from school, have fresh fruits and vegetables ready to eat - apples sliced, oranges peeled, etc. Pretzels, cereal, snackmixes, and baked potato or corn chips can all be a great substitute, but without all the fat. Remember that salsa is actually a way for your kids to eat their vegetables! Limit your kids' "screen time"
Research shows that the time spent watching TV and on the computer is directly related to being overweight (as well as to other negative behaviors). In fact, kids who watch TV with meals have diets that may include fewer fruits and vegetables and more pizzas, snack foods, and sodas.The American Academy of Pediatrics recommends limiting screen time to one or two hours a day. Give your kids "active" chores every day, such as walking the dog, running an errand on their bike, raking leaves, sweeping the porch, etc. Encourage active games with children in the neighborhood such as basketball, tag, red light/green light. Children often need direction in their free time. Left to their own devices, they will almost always gravitate toward the TV. Motivate your kids to eat healthy by teaching them about nutrition. Using the food pyramidas a guide, even a young child can count the number of foods he has eaten from each group. For older kids, the motivation for eating right can be having more energy for a sport, for doing better on tests, or for being able to fit in outgrown clothes. You can teach older children to begin looking at commercials for sugary foods on Saturday morning cartoons with a wary eye. Get the whole family involved in meal planning and preparation. Kids who help cook are more likely to eat! Preschool children can make choices about what's for dinner. For example, ask "Should we have carrots or broccoli for dinner?" 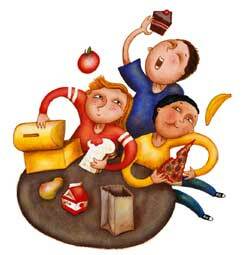 School-aged children can help plan a balanced meal from looking at the food pyramid. Have children make a balanced meal out of their favorite entrée. For example, how can macaroni and cheese be part of a balanced, healthy meal? Third graders and up can prepare most of the meal with a little help. An adult should always supervise children in the kitchen. Bean burritos or tostadas with low fat cheese. Even nachos made with baked chips can be the main dish - just don't tell your kids they are healthy! Vegetarian lasagna. Instead of meat, use eggplant, other vegetables, tofu or soy crumbles. Veggie burgers. Forget the drive-thru when you need a quick meal. Many frozen vegetarian burgers can be popped in the toaster or microwave. Spaghetti with tomato sauce and soy crumbles. Soy crumbles can be purchased frozen and TVP (a dehydrated soy product) can be bought at a health food store. They are both great substitutes for ground beef.